Machaelle's Question & Answer Forum - June 2015 - Perelandra Ltd.
As part of today's Virtual Open House, Machaelle offered this Online Question & Answer Forum. Vicki's Question: About the Question Hot Line - we continually suggest that people use it. Sometimes we remind folks, "It's Hot Line day," Sometimes they come back to the Group and share what they have learned. Machaelle's Answer: Terrific. I'm really glad to hear it! It's the best way for us to support your efforts. MJ's Question: Clarifying follow-up to bees. Thanks, I follow local guidelines on supportive plants, avoiding neoconotids (sp.) Wondering if adding a Perelandra Essence to the water would help. ETS for Animals? Bees are not animals. I will consider the Garden Workbook. Thanks for your Open Houses and all the discounts and support you provide. Machaelle's Answer: The problem is that I simply do not have the answer to your question about the bees. Nature does. So if you really want the answer, you'll need to consult nature about this. And the Garden Workbook's Troubleshooting 2.1 is an excellent guideline to use. By the way, bees are animals. I still would not recommend putting ETS for Animals in the bird bath unless nature tells you to do so. Robin's Question: Hello! Ironically timing couldn't be better for the fact that a question popped into my head yesterday evening... Unsure whether or not this is covered in the MAP book, so apologize if it is, but am going to risk it and ask anyway: If someone is in a dire situation, is able to open up an emergency MAP coning, however ends up actually dying during the session, what does the team do to assist the soul in transitioning, and what actually transpires as far as the coning being shut down on the persons behalf? Thanks so much! Machaelle's Answer: In this situation, the MAP team actively assists in the transition and the coning is automatically closed once the person has completed that transition. Vicki's Question: Machaelle, I really want to extend my gratitude for all that you and your staff offer, and for your immense generosity in always ensuring the affordability of products for one and all, throughout the year. The Essential MAP Group that was formed on Facebook, and which we told you about last year, has now grown to almost 200 members. What a wonderful group of friends of Perelandra, who share their experiences, and support one another, not just about MAP, but about "all things Perelandra." We keep one another informed of all your sales offers, forums, PIC info, etc, by posting all Perelandra links as they come out. Machaelle's Answer: Nice. And if you run into questions that you don't know how to answer be sure to contact us. We'll be happy to give you the answer to pass along to the group. Kathy's Question: Hi Machaelle! I too travel occasionally for work and personal, average three days every two weeks or so. I can't take all those bottles with me either, so I had a conversation with PIC and came up with a "Travel PIC List." Those bottles are kept in my suitcase and always ready for a trip. Hopefully I'm not messing the whole PIC thing up by doing this! I check on retest dates frequently so that doesn't seem to be a problem. Thanks and love to you and the team. Machaelle's Answer: This is a good example of how PIC personalizes the process. I can't recommend it across the board for everyone because I'm not sure it would work for everyone. However, I'm glad it works for you. Barbara's Question: Can you advise how to best get black carpenter ants out of the house. Thank you. Machaelle's Answer: The best advice I have of getting the wildlife out of your house is on page 329 of The Perelandra Garden Workbook in the section titled, "The Top Perelandra FAQ." FYI: Your question is the the top Perelandra FAQ! Nancy's Question: Hi Machaelle, First, I apologize if you have answered this already. I just returned from a long trip and don't have time to go back and read them, then get my question in. The first long trip we took early in the Spring, I packed all the essences that were called for in a PIC session. However, it was very difficult to keep it going, and two of the essences called for I needed to order, but didn't have time to get them in. This trip I tried again, but too close to the departure time, and only halfway through the previous dosing regimen. What do you suggest? Re-test halfway through, then order? Or, just go with what I have on hand? I love the process, and feel that I am getting back on track health-wise finally. Thank you so much, dear Lady, for all that you do for us. You're in luck, I have already answered this in Question #25. Eileen's Question: I could do MAP every day but was advised by the hot line not to do that. Any thoughts? Thanks! Machaelle's Answer: The people I have on the Question Hot Line are well-trained and experienced and I agree with what they have advised you to do with MAP. Ruth's Question: Hi Machaelle - I don't have a question. I do want to thank you for PIC. It is doing wonders for me. I am starting to lose weight without feeling like I am in a battle. It is helping with my digestive system issues, with inflammation, processing food, etc. I am feeling so much better and healthier. PIC is amazing and I am using to understand some other things that I needed cleared up for me. Thanks again, Machaelle! Machaelle's Answer: Hey babes! I'm really glad to hear from you. And as always I'm pleased to hear how your journey is coming along. This is fantastic and you're doing so well. So KUDOS! to you. Glad PIC is a key for this. Machaelle's Answer: With PIC focus wording, simplicity is the key. So if you don't know what the core personal focus is, but you have a bunch of symptoms, just go to PIC read through your symptoms and say that you would like to address the core issue connected with those symptoms. Proceed with the testing from there. Martin's Follow-up Question: SLG PIC: the tray I got has many ‘slots’ for drops, but I only use, say, 4 slots for one SLG PIC. Can I use the same tray for another SLG PIC without emptying and cleaning it in between, by utilising the other slots? Or do I need a clean, fresh tray for each SLG PIC? Thanks! Machaelle's Answer: To be on the safe side, use a clean, fresh (dry) tray for each PIC unit. This way you absolutely know that nothing is interfering with those patterns. Martin's Question: Hello Machaelle, for a start can you please not boast about your high temperatures, instead send some of your heat to us in Scotland please – it’s bl**dy freezing here and we have had very little summer so far. Anyway, I have some PIC questions. Here my first: How do I ever go on holiday again? I will not be able to travel with all bottles, so will revert to regular MBP taking while away. Would it be polite to inform PIC in some way that I will stop all my SLG PICs and personal PICs? How do I restart when I come back? Machaelle's Answer: First of all, it's obvious that we are proof that weather never pleases anyone! But just to rub it in, we're on our 3rd or 4th day of 90+ degrees Fahrenheit. The easy answer to your holiday problem is — never go on another holiday! However, if you insist on travelling and you have too many bottles to lug around, you end your daily dosages the day you leave for the trip. When you return, open a session with PIC and focus on each PIC focus individually and test to see how many more days you need to extend your present dosage period and when the next retest is to be scheduled. If you find out that you are to retest right away, that means that by stepping back from the rhythm for your trip, you are now requiring a whole new unit to pick up where you left off and continue forward. MJ's Question: What can we do to help the bees? I realize that a balanced garden can be a sanctuary for all. I notice honey bees drink from the birds' water dish. Could we add something to the water to help? Machaelle's Answer: There is all sorts of literature of research and recommendations of what people can do. You might investigate the literature that relates to the bees in your area. I don't think it includes just adding something to the water. You could read The Perelandra Garden Workbook and do a Troubleshooting 2.1 and work with nature to address the problem. Alise's Question: I am a certified long term care ombudsman. I recently quit my assignment to an assisted living facility after 3 years because I was so frustrated at the callous and unhealthy way the owner and administrator run the place. Even the State folks have not helped much. Since I do not own the place, how can I use Perelandra processes to help improve things for folks at other places in the future? Is this an appropriate use of PIC? Machaelle's Answer: The ethical issue here is that you should not use the Perelandra processes or products unless you get verbal approval from the owner and administrator for incorporating these things AND verbal approval from the elderly resident to use the products/processes for them. If the person is unable to give you the okay, you must seek approval from their guardian. To not follow these guidelines is to conduct yourself unethically. However, you can use PIC for yourself and how you function in your role of ombudsman, and how the pressures of the job are affecting you. Sharn's Question: My eyes were opened to Perelandra this past week through a profound circumstance. The journey here has taken 40 years. How do I keep from becoming demanding at this point and requiring more from nature than I can give back? Machaelle's Answer: You know, for discovering the Perelandra path that's comfortable for you, I recommend you call the Question Hot Line: 1-540-937-2153. It's open today for another 2 hours. Machaelle's Answer: No, I don't cover this in Garden Workbook specifically because all you need to do is declare that "this land that is a garden is now being allowed to convert to the wild." Then step back, get a beer, settle in a chaise lounge, give nature back the reigns and watch what happens. Watching how it heals and develops when left on its own is a lesson in itself. Machaelle's Answer: "P1" and "P2" are not included in the Nature Program Essences Set simply because they weren't included by nature and I never bothered to ask why. It falls under the department of "idle curiosity" and I try to stay away from that as much as possible. However, I think you're probably accurate in noting that "P1" and "P2" would be picked up in the new Internal Parasites and External Parasites Solutions. Thanks for your thanks. Virginia's Question: The question you just answered triggered my next question. I have poison ivy in my backyard. I don't want to send it to the neighbor's yard. I am concerned that children who play in my yard may get into it. Any suggestions? You're probably not going to believe this, but thanks to climate change and the increasing levels of carbon dioxide, we are all going to be dealing with more and more poison ivy — because poison ivy loves carbon dioxide. It's become my preferred ground cover! Short of using an herbicide which I definitely do not recommend, you're not going to get rid of it. Even if you pull it up. You cannot keep a good poison ivy plant down! So I recommend what we did for our on-site Open Houses years ago. We posted signs everywhere warning visitors about the poison ivy. And in your situation you might consider talking to the parents of any of the children. Your last and probably most effective resort is to let the little darlings play in the poison ivy one time. After that everybody will be keeping them out of your poison ivy patch. It only takes one time. Also, if you have a lot of poison ivy in your backyard, you're not going to be able to keep it out of your neighbor's yard as it moves in that direction. So let your neighbor know there may be creeping poison ivy. Now for the good news: Poison ivy produces a berry that birds love. It's a favored feeding delight. Geraldine's Question: Hi Machaelle, death terrifies me. It always has done. Both the process of it and what lies after. I try to focus on my life and work etc but it is always there. I am so scared of the time when I will be dying and it haunts me. I have used MAP, calibration, PIC and essence procedures but nothing really helps. I just wonder if you can help with suggestions or advice? My thanks to you. Machaelle's Answer: How about a different perspective on death? Read Dancing in the Shadows of the Moon. Machaelle's Answer: I think in this situation, taking one dose of ETS for Humans 5 times daily will make all the difference in the world in how you're addressing this. If you feel up to it further down the road to include other processes, call the Question Hot Line (1-540-937-3679) and let them help you map out a plan. Shirley's Question: I have the Essence boxes on the floor, lined up one behind the other, in sequence of Rose to Soul Ray. Everything else is on a neighboring butcher block table, lined up according to the PIC list. Each bottle sets on a little sticky note with its name to reserve its spot. Space is left to the right of each bottle to accommodate any extra bottles of the same solution. Easy to see when something is getting low. Machaelle's Answer: Another great suggestion! You guys are getting really creative out there. Kat's Question: Hi again, this isn't a question, it's just a thought for Pam. I store my essences in those pretty, decorative boxes you can find in Michael's craft stores, JoAnn Fabrics, TJ Maxx, etc. They are fairly inexpensive, and come in many different sizes, colors and patterns so you're bound to find some you like. Although I still have to take them out when I'm working with them, I can store my bottles upright & 'right out in the open' without things looking messy when I'm not using them. Machaelle's Answer: Excellent suggestion Kat! Great idea. 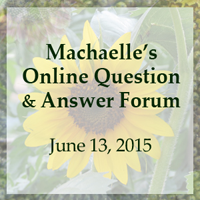 Yvonne's Question: Hi Machaelle, thank you for doing this forum when it is so beautiful outside. My question concerns the fabulous PIC. I have not consulted PIC directly about processes like MAP or SLGs. I use the resource mainly for issues related to essences and formulas. I think that the PIC is always learning and adding new knowledge and info. Can I ask the PIC technical questions about the amazing processes themselves apart from questions about those wonderful bottles? Thank you. Machaelle's Answer: I address this in one of the PIC FAQs here. PIC is a process unto itself and does not change how you use MAP or SLGs, so confine your questions to just the bottles. Lansing's Question: Hello Machaelle! My questions has 2 parts: 1) What is the shelf life of essences? I have sets from Perelandra that are around 10 years old. 2) I thought I read somewhere on the site that cleansing essences after passing through airline security x-ray scanners is no longer necessary. Is that true? And if so- would it be true for my older essences assuming they are still good? Thanks for all the work and support you and the team provide! Machaelle's Answer: On the shelf-life, the essences are fine but you may need to replace the droppers. They can deteriorate over time. Yes to both of the other questions. X-ray scanners no longer disrupt them, even if they're old. Machaelle's Answer: He might be coming back so much because he's found a good, safe place to sun himself. I recommend you go on your trip and extend it a few extra days. Let everybody else in your family deal with this. (But tell them not to kill him!) Or if you're really concerned about it you can call animal control and they'll come out to safely catch him and release him somewhere uninhabited. June's Question: Should we still use the Nature Healing Process for Companion Animals or just use PIC now? Machaelle, I also want to tell you from the bottom of my heart, thank you for everything you've given us. You are an awesome lady and I can't thank you enough for all you've done for me and my cats. It has made such a difference for us. Machaelle's Answer: You can still use the Nature Healing Process for Companion Animals. But to be frank, I recommend PIC. It's more comprehensive. And thank you for your kind words. Shirley's Question: The animals, environment and I all deeply appreciate PIC. Thank you! One story: I went to my health care provider 8 weeks after doing My Daily General Health focus with PIC and all my numbers had suddenly improved. Her mouth actually dropped open with surprise. Now we are working at a new level. I am so appreciative of you and what you do + your PIC focus suggestions, the hugely valuable Question Hot Line and your deeply discounted specials. Thank you, thank you. Machaelle's Answer: This is great to hear. I'm very pleased to hear how PIC has helped your numbers! Congratulations! Lisa's Question: When I take the Immune Balancing Solution, if my immune system is stressed, it feels like it is being "realigned" somehow. What exactly is going on? Machaelle's Answer: It's being realigned somehow. Enjoy! If you'd like to know what's going on with you when you take the Immune Balancing Solution, you can refer your question to the PIC Classroom and get insight. Kat's Question: Hi Machaelle, Thank you again for the amazing work you do. I can't imagine life without it. I hope you someday get to see what a huge and positive impact you've made on the planet! I would like to know if you will offer all the MBP and other solutions (especially SLG solutions) in 8 oz. refill bottles eventually. I feel like I go through gallons of the stuff, & it seems so much more cost effective to buy the bigger bottles. Thank you for all the constant sales and specials too. I know you try hard to make this affordable. Marilyn's Question: Hi Machaelle, I have been healthy this entire school year (I teach 36 little ones), but finally got a cold which I cannot get rid of. I take the Immune, Respiratory and Lymphatic drops each night. Any thoughts on using the drops more often to help get rid of this cold, which could be turning into a sinus infection? Or any other suggestions? I know you aren't my physician, but these products are amazing! Thanks for your help. Machaelle's Answer: This may not be a cold. There are all kinds of annoying, disease-producing microbes flying around right now. I urge you to take a leap and consider working with PIC (the Perelandra Information Center). For your focus, don't assume you're dealing with a cold. Just think about the word "cold" with quotation marks around it to indicate it's your name for what's going on, and then go from there with PIC. I think once you read the information on PIC, you'll feel inspired to make the leap. JL's Question: I recently spent some time inpatient in a psychiatric hospital and according to the rules there was no way to have my ETS or any other Perelandra solutions or essences with me. Nothing alcohol-based is allowed on the unit, but even if I had the vinegar-based versions, I still would not have been allowed to have the glass bottles. This got me thinking. It seems that when one is suffering acute mental and emotional pain, one would really benefit from the Perelandra products, yet I could not figure out how to keep them with me and still be within the rules. Any thoughts or suggestions on what to do in such a situation? Machaelle's Answer: We have a former nurse on staff here and we asked her your question. Here's her answer, which we think makes a lot of sense under the circumstances: You're going to have to get your doctor's permission to use ETS or any other Perelandra Solution, and the nurses are going to have to be instructed to administer it to you. The rules are tight as you know. And to be honest, I would ask the doctor just to okay ETS for Humans while in the hospital and resume using the other Perelandra processes and products once you return home. Now that you're home, I urge you to call the Question Hot Line (1-540-937-3679) and get ideas on the best approach with the products you mentioned that will serve you well at this point in your process. Thanks for the question. This was a good one. Chris's Question: Hi Machaelle, Thank you for all your wonderful work. My interaction with Nature is so much better because of all your books and processes. I rarely have a question because your writing is so clear and comprehensive. But today I do. I find I do not feel good about weeding and thinning plants. I have resistance here. How do you view these? I remember your discussion about harvesting with a good sharp knife but do not recall a discussion on weeding. Machaelle's Answer: A garden by definition is an endeavor between humans and nature. Out in the wild, nature adjusts and shifts so that the ratio automatically occurs and all the plants have what they need — spacing, timing, etc. Nature doesn't sit around with a packet of radish seeds, throwing them all into a defined location and thus creating a chia pet. Because we humans are involved in that, for the sake of the health and the growth and the timing of those radishes we need to thin them out and leave the remaining seedlings in the optimal positions. A garden is where you facilitate plant growth. If you don't want to facilitate that, change your definition, convert your garden to wild and don't touch it. Sandy's Question: There seems to be so many Chemtrails. I have heard that there has been a development of ingredients in the chemtails that include some serious biologicals. Do you know if this is true and what would you recommend that is best to help our plants and ourselves. Machaelle's Answer: I don't have any information on this, but if you work with The Perelandra Garden Workbook and work your garden co-creatively with nature, these issues are already taken into consideration as far as the plants are concerned. Terry's Question: Hello! Thank you for all your good work. I've been working with ETS for SLG For a very complex project with a lot of different parts - fundraising, recruitment, marketing, construction etc. How often should I work with ETS? Should I use it for the whole project in general, or each component? Thank you! Machaelle's Answer: With a project this complex, you should probably be taking several doses of ETS for Humans daily! As for your project, you're going to have to ask nature when you have an SLG session how often you need to be using ETS for Soil-less Gardens. Is it daily? Is it for the whole project in general? Is it for each component? Is it for each of these? I'm afraid I can't provide specific answers for you, but your SLG project coning can. Also, I'm very pleased to read that you're using soil-less gardens for such a complex project. Machaelle's Answer: I don't think you can look at the Grand Canyon, Yosemite National Park, Victoria Falls, the Brazilian rainforest, the Arctic tundra . . . without coming to the conclusion that #1: Nature KNOWS asthetics. And #2: Asthetics as far as nature is concerned is just another word for balance. Pam's Question: I'm wondering if you, or anyone, has come up with a way to group and store, upright, the 2oz MBP and Perelandra solutions? I'm shuffling bottles around and knocking them over. I'm fiddling with making my own boxes out of cardboard; (I figured out a 6x6x3 box, standing upright on a side will nicely hold 8 2oz bottles. If no one has a better idea, I'll just glue those together to store the bottles and keep them safe.) However, I am hoping someone found some kind of organizer that can be adapted to this size and grouping. Machaelle's Answer: Some people store their bottles on trays that make them easy to move without knocking them over. One person converted a one-foot-square little dresser with 5 or 6 drawers into a Perelandra storage unit and set it up next to their desk. Each drawer is dedicated to a different group of bottles: Essences, MBP Solutions, Perelandra Solutions and ETS with an extra drawer for empty solution bottles and spare droppers. If anyone else out there has any ideas, let us know and we'll post them on this forum today for you to consider.